Image above: Whinlatter Forest, © Dave Willis and Cumbria Tourism. We offer a growing library of local bike rides to suit all ages including "The Bowderdale Classic" for enthusiasts (see also: http://fattyres.co.uk/routes/yorkshire-dales/bowderdale-classic). All rides include a digitised route that can be loaded into a hand-held GPS or mobile phone App which should ensure that you don’t get lost! 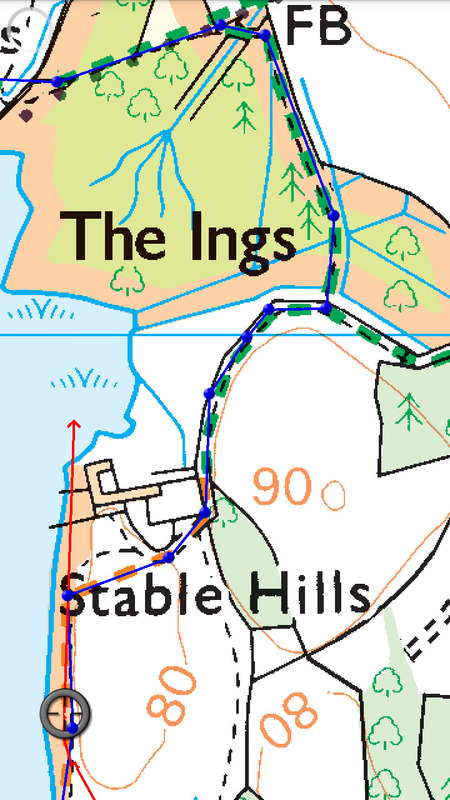 The map to the left (OS 1:25k HD Northern England 2016. Copyright © 2016 Crown Copyright; OS, Licence Number PU100034184) is an actual screenshot from a mobile phone taken during the Walla Crag walk (see "Walks" page). The blue line superimposed on the map is the route loaded from our library whilst the circle containing the cross-hairs at the bottom near the shoreline is the current position with the red arrow indicating the direction of travel. We don't supply the App or the maps but you'll find "How To" Articles at the bottom of this page (a recent Android mobile or iPhone is required). The Apps and the detailed OS Maps take the guesswork out of riding - you don't have to work out from what you see around you or from a textual description in a Guide book where you think you are ... you'll know and you can simply enjoy the ride rather than worry about getting lost - so leave the books behind ... but do take a spare battery! As a guest of The Hyning Estate then we you can download the route and any attachments from our server and after your ride we encourage you to email us any photos or route details / interesting facts / places to eat / things to do or see that you think would be of interest to other guests and we'll attach these to the download for future guests. If the ride you’re looking for isn’t currently in the library then we’ll be pleased create the electronic route for you providing that you can give us at a good description of the route. (At least 24 hours’ notice is required, and subject to our availability). 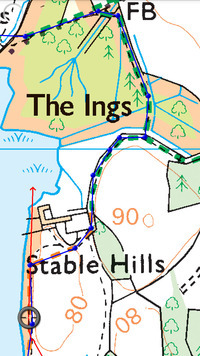 Our routes overlay the OS maps which are far more detailed than the normal mobile Google maps showing all the footpaths, contours and map symbols. Don’t be tempted to make do with the free base maps that come with the Apps as they are not detailed enough and will spoil the rides for you. Mobile Apps aren't for everyone so if you'd prefer you can browse the rides and the material provided by other guests using the shortcuts on the desktop of the Virtual PC in your cottage and buy or ask to borrow the relevant Map & Guide to take with you on your ride. If you're interested in cycling or walking then we recommend that you load the OS Maps App and buy a map or subscribe to one of the OS map options before you arrive for your holiday. Try loading the example rides below. [If using Memory Map then please note that your phone will only download tiles from the internet as you need them so please ensure that you take a look at the whole ride on your phone before you leave (via WiFi) in case the mobile phone signal is poor at your destination]. If you're using the OS Maps App with a subscription then you'll need to download the section of the map that you need for your ride before leaving].